The following analysis discusses the demographic characteristics of each of the five social media platforms in the survey. Fully 72% of online American adults use Facebook, a proportion unchanged from September 2014. Usage continues to be especially popular among online women, 77% of whom are users. In addition, 82% of online adults ages 18 to 29 use Facebook, along with 79% of those ages 30 to 49, 64% of those ages 50 to 64 and 48% of those 65 and older. Some 31% of online adults use Pinterest, a proportion that is unchanged from the 28% of online adults who did so in September 2014. Women continue to dominate Pinterest – 44% of online women use the site, compared with 16% of online men. Those under the age of 50 are also more likely to be Pinterest users – 37% do so, compared with 22% of those ages 50 and older. Some 28% of online adults use Instagram, a proportion that is unchanged from the 26% of online adults who did so in September 2014. Instagram continues to be popular with non-whites and young adults: 55% of online adults ages 18 to 29 use Instagram, as do 47% of African Americans and 38% of Hispanics. Additionally, online women continue to be more likely than online men to be Instagram users (31% vs. 24%). A quarter of online adults use LinkedIn, a proportion that is unchanged from the 28% of online adults who did so in September 2014. As was true in previous surveys of LinkedIn usage, the platform is especially popular among working-age adults as well as college graduates and those with relatively high household incomes. LinkedIn is the only major social media platform for which usage rates are higher among 30- to 49-year-olds than among 18- to 29-year-olds. Fully 46% of online adults who have graduated from college are LinkedIn users, compared with just 9% of online adults with a high school diploma or less. The site continues to be popular among the employed – 32% are LinkedIn users, compared with 14% of online adults who are not employed. Some 23% of all online adults use Twitter, a proportion that is identical to the 23% of online adults who did so in September 2014. Internet users living in urban areas are more likely than their suburban or rural counterparts to use Twitter. Three-in-ten online urban residents use the site, compared with 21% of suburbanites and 15% of those living in rural areas. Twitter is more popular among younger adults — 30% of online adults under 50 use Twitter, compared with 11% of online adults ages 50 and older. While there were no changes in overall usership on any site when comparing data from the fall of 2014 and the spring of 2015, a few social media platforms did see an increase in user engagement. The proportion of daily users on Instagram, Pinterest and LinkedIn increased significantly from 2014. Today, 59% of Instagram users are on the platform daily, including 35% who visit several times a day. This 59% figure reflects a 10-point increase from September 2014 when 49% of Instagram users reported visiting the site on a daily basis. Similarly, the proportion of Pinterest users who visit the platform daily rose from 17% in September 2014 to 27% in April 2015, while the proportion of daily users on LinkedIn increased from 13% to 22% over the same time period. Twitter saw no significant changes in its proportion of daily users. Some 38% of those on Twitter use the site daily, a figure that is statistically unchanged from the 36% who did in 2014. Facebook continues to have the most engaged users – 70% log on daily, including 43% who do so several times a day. 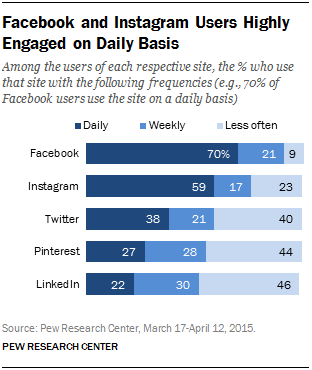 This overall proportion of daily users, however, is unchanged from the 70% who used Facebook daily in 2014.